“Life? Or Theater?” is the title of an unusual series of paintings by a little known artist, the German-Jewish painter Charlotte Salomon. Unusual here becomes a cruel understatement when the bizarre nature of the work is considered: Conceived as a “Singspiel” – a form of antiquated German operetta blending many styles and genres of music, often humorous and including folk songs and marches – the work consists of over seven hundred works painted in between 1941 and 1943, while Charlotte Salomon was hiding from the Nazis in the south of France. Seven hundred seventy nine paintings is an astounding number even for the lifetime work of an artist, let alone to be assembled under a single concept, but this is where the idea of the “Singspiel” is deployed: The hundreds of paintings are not only images meant to evoke, please, stir up or confront, but rather, a continuous narrative of painted images, text and music. The paintings, presented in acts and chapters, tell the story of the painter’s life from the perspective of an outside narrator and include a plethora of characters, including herself, her father, her step mother, an obsessive love and other relatives and acquaintances. Not being satisfied with the production of images alone, Salomon conceived “Life? Or Theater?” as a total work in the now unpopular but ambitious – and Romantic – tradition of the German 19th century to merge poetry, music and visual arts; including a script with words written into the paintings or overlaying the images and also a soundtrack chosen by her to complete her stories, ranging from Nazi march songs, lieder from Schubert and music by Mozart and Mahler. 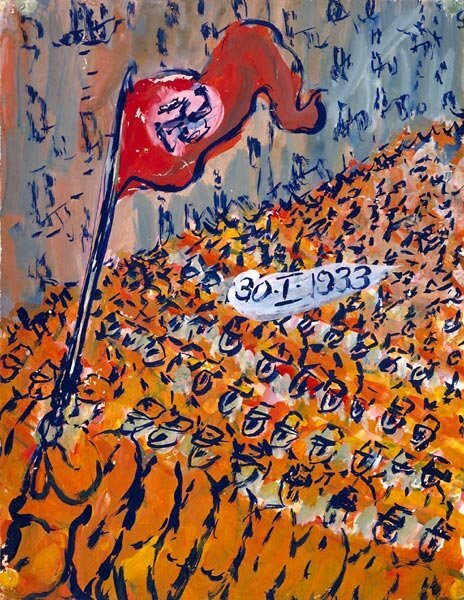 In less than two years she painted over two thousand gouaches and as the work progresses, she turns more expressionistic and violent, perhaps being aware of her own fate and being consciously aware of wanting to give all the details of her story before the tragic end: In 1943, when she was only 26, she and her husband were captured by the Gestapo and deported to Auschwitz, where she and the unborn child in her womb were gassed to death soon after arrival. Coming from a wealthy family and born in Berlin in 1917, Salomon succeeded – surprisingly – in gaining admission to the Berlin Academy of Fine Art in 1936 and studied there for two years when the quota on Jewish students already existed, and was forced to leave in the summer of 1938. After the infamous Kristallnacht that year, the family decided to leave the country for France and there both her mother and her grandmother committed suicide. Around this time, Salomon began working on her extraordinary lifework haunted by the question of, in her own words, to take her own life or undertake something wildly unusual. In 1943, as the Nazis intensified the search for Jews, she entrusted the works to a friend with the words, “Keep this safe, it is my whole life”, just shortly before her arrest. Salomon’s work, though exceptional and highly praised by Chagall, has never been exhibited or printed in its totality due to the massive space required – hardly fit for a modern gallery – nor has it reached the art market – unlike for example the famous and controversial paintings of Adele Bloch-Bauer by Klimt – since it was entrusted in its entirety in 1971 to the Jewish Historical Museum in Amsterdam. Nevertheless, her work remains one of the most vivid and loquacious documents and testimonies of the Nazi Holocaust whose unfolding story, told through the eyes of an extremely talented young girl, is recounted step by step. Had Salomon and her family not been rounded up in France by the Nazis and sent to meet their deaths in Auschwitz, we would have been met here with what was probably one of the most prolific careers in European art that was brought to a premature end by the wave of Totalitarianism that swept all over Europe in the middle of the 20th century. Little as we know about Salomon’s work, it is more than we know about the hundreds and thousands of others whose lives were also taken by the brutality of the Nazi war machine in its attempt to exterminate the Jewish people and many others – gypsies, homosexuals, dissenters – that the most murderous regime of modern times, considered undesirable. The liberation of the concentration and death camp known as Auschwitz-Birkenau – where over one million people, Jews and non-Jews alike met their deaths – by the allied forces on January 27 1945 was commemorated yesterday by the vast majority of Western nations, in what the UN General Assembly designated in 2005 as International Holocaust Remembrance Day. On this annual day of commemoration, according to the UN, every member state has an obligation to honor the victims of the Nazi era and commit to develop educational programs to prevent future genocides. In 2012, the commemoration of the atrocities of Auschwitz in which countless lives were lost – including that of Charlotte Salomon and her unborn child – comes not without a certain degree of bitter irony as many respectable UN member states – including the regime of Bashar Al-Assad in Syria – in the Middle East not only failed to live up to their obligation to commemorate the liberation of Auschwitz. They are also committed not to the development of educational programs to prevent genocide, but instead, engaging actively in it; waging a cruel and bloody war against their own citizens at the same time that the same UN and Western states that declared January 27 International Holocaust Remembrance Day, watch idly and engage in political jumbo mambo while the lives of countless Syrians are lost by the hour to the stubbornness of the Assad regime and their allies, to relinquish power to the people. On that very day, human rights keep being abused not only in Syria but everywhere in the region from Israel to Egypt, Saudi Arabia to Bahrain, Turkey to Iran. With unprecedented smugness and a distorted sense of reality, commemorations – that resemble more celebrations – were held in the United States and Israel, under the selfish and arrogant pretense that the legacy of the Holocaust is the private property of the Jewish people and the State of Israel. While no doubt the Holocaust is fundamental to the narrative and logic on which the existence of the Jewish State is defended – probably more so than on a Biblical right – it is an act of political exploitation and hypocrisy that the lessons of the Holocaust are claimed to have been learnt, at the same time that the world turns a blind eye to the burnt and dismembered bodies, to the shelling of houses, to the countless rapes, displacements and assaults that come out of Syria on a daily basis. It would be safe by now to assume that hypocrisy is a two-way street: On the one hand, while many elderly Holocaust survivors in the State of Israel live below poverty line without a decent pension or access to proper welfare service, it is also true that in the Arab world many people – not only governments, but also activists, peace organizations and human rights defenders – keep deliberately silent about commemorating something of such historical importance as the liberation of Auschwitz, at the same time that they claim to have not a grudge against the Jewish people but only with the State of Israel. Elsewhere, in an exchange of letters with the Zionist scholar Gershom Scholem who had severed ties with Arendt over the publication of a controversial study on Adolf Eichmann in which Arendt made the argument for the thoughtlessness of Eichmann, claiming that he was just a bureaucrat, a clog in the system, another element in the “onion” shape of the Totalitarian regime and not necessarily evil in a radical manner but rather in a completely banal and thoughtless way; Arendt tries to explain to Scholem that even though anti-Semitism was central to the totalitarian nature of Nazi ideology, what took place in the camps was the collapse of all moral standards of good and evil and at that point, it had nothing to do anymore with the Jews. It is precisely this phenomenon what Arendt claims that we cannot become ever reconciled with. It does not mean to say that there is such a thing as universal guilt or universal innocence – idea which is naïve as much as it is irresponsible – but rather that the problem of the Holocaust, the fabrication of corpses, the bureaucratic and systematically planned destruction of human life, the superfluous state in which human life is placed and the consequences that stem thereof, are not a problem exclusive to the Jewish people or to Israel but rather, it is something with which every citizen of the modern world should be concerned. More than fifty years after the liberation of Auschwitz however, it is not only that the systematic destruction of life innovatively introduced by the Nazis has been practiced continuously but it has also been improved and mastered in detail by more countries than fit in the fingers of the hand. The same countries that commemorate the liberation of Auschwitz and take pride in having been elementary in the construction of what we call today, not without irony, the free world, also turn a blind eye themselves to the daunting presence of this evil – radical or banal as it may be – whenever it happens and the Madison Avenue language of political marketing and image-making takes precedence over the priceless lives of entire cities, regions and nations; just like it was over fifty years ago when Charlotte Salomon and her talent and her child were gassed to death in Auschwitz. It is not only that they turn a blind eye to what happens elsewhere but at home too, for example in Austria – country that has witnessed an increase in far right-wing activity – where far-right leaders have organized a ball on the occasion of Holocaust Remembrance Day in which in words of a demonstrator against the event, they would be dancing on the graves of Auschwitz. In the meantime, public discourse against Muslims in many other Western countries has moved to the mainstream and can no longer be considered offensive as it has been endorsed by nascent political figures who have thrived on promoting this agenda, rather than in spite of it. 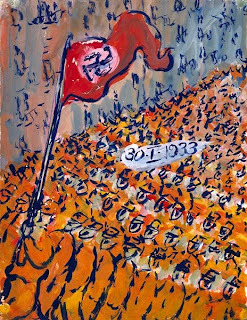 While the legacy of the Holocaust is monopolized by a few and deliberately denied by many, one can only wonder how many Charlotte Salomon are somewhere out there in Syria? How many of their stories are going to be saved? Who is going to commemorate them? The remembrance of Auschwitz today is not only a matter of remembering our dead, Jewish and otherwise – and that is not really the essence here – but also of remembering what happens when people and nations turn a blind eye to human suffering, which is alas, what is happening in Syria this very moment.